I remember very clearly the first time I ever sailed on a catamaran. DrC and I had already committed to buying one and sailing away. We had chartered a Fountaine Peujot for day. However in typical Pacific Northwest fashion, the day was bright, beautiful, and utterly windless. So that wasn't the day. 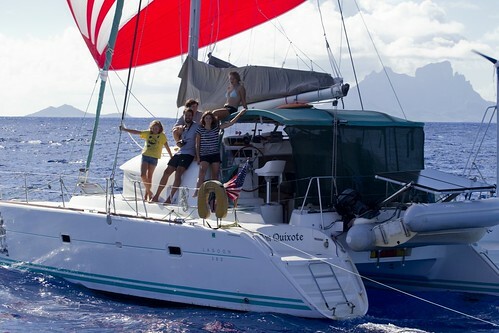 No the first day I sailed on a catamaran was on a Lagoon 410 by the name of Sun Baby. It was owned by the Kerns, a family who were in the last stages of their own preparations for a cruising year in Mexico. While we took another year to get out there, this was not our only time on Sun Baby as the second owners cruised with us, and we enjoyed sundowners on her deck several times. The first sail was perhaps appropriately and a moderately blustery day in Elliott Baby. Dan got the sails up and the boat trimmed on a course for Eagle Harbor and we took off in flat seas at an exhilarating rate. The girls and I donned life jackets and sat on the tramp with the wind our faces. DrC gave me a hug. He didn't say anything. He didn't have to. We were all trying to put ourselves on that tramp in a dreamy but eagerly awaited future. The sail was quick, without swell or wind waves. We went out, we tacked and went back to dock. We had a drink and all smiled at each other somewhat smugly and self-congratulatorily. I think we peed at the beautifully appointed restrooms on the immaculately kept grounds of Elliot Bay Marina on our way out. It was marvelous. That sail had about as much to do with ocean cruising as an Imax movie has to do with hiking to the bottom of the Grand Canyon. For some reason, however, the memory of that first sail was delivered sharply on my mental doorstep yesterday afternoon. Maybe it was simply the closure of the experience. The first sail on a Lagoon and perhaps the last truly big sail on this one. It might have been a trick of the light. Or it might simply be in contrast to some of my other musings as I sat at the helm on a close reach with the wind at 12, the sun shining, and nothing to gaze on but the dwindling lump of Tongatapu receding behind us. One thought that occurred to me is that I used somewhat obsessively and compulsively calculate our travel distance in terms of remaining fuel. There was always this thought that if we ran out of fuel, what would we do? As if somehow, we would get stuck by the side of the road in the desert of ocean between Mazatlan and La Paz and have to walk with a jerry can to the nearest gas station. What would we DO? Well, try putting up the sails. Don Quixote is, when all is said and done, a sail boat. She sails. Another thought that wafted through was that Biosecurity better not be too picky about bugs. I think we have dead bugs all over the walls of all three cabins after our visit to Ha'apai and Tongatapu. Little bloody smears it is going to take bleach, elbow grease, and a putty knife to remove. I also calculated the various permutations of meals it is possible for me to assemble using a can of French ham, half a bag of rice, 2 cups of wheat flour, and the 28 eggs remaining in the galley but not permitted into New Zealand. So much for savoring the experience. Minerva Reef is roughly 250 miles south and west of Tongatapu. It is very close to the rhumb line for a southbound vessel following the standard pilot recommended target of 30S 175E then due south to your port of entry. The wind blew hot and cold all night running us sometime up to > 7 knots and then moderating till we were creeping along at 4. It looks like we're averaging about 6 and should make the reef sometime tomorrow morning. The question of whether to stop or push on will be decided there. As of now, the weather looks good all the way down, so we might just run it straight through. We might have to in any case. The kids hate canned ham.